Blueberry muffins used to be one of my favourite foods (along with popcorn and pink doughnuts). But since I don’t have clean eating alternatives for all of these yet (see my Clean Eating Popcorn), I am entirely satisfied with some Clean Eating Blueberry Pancakes instead! 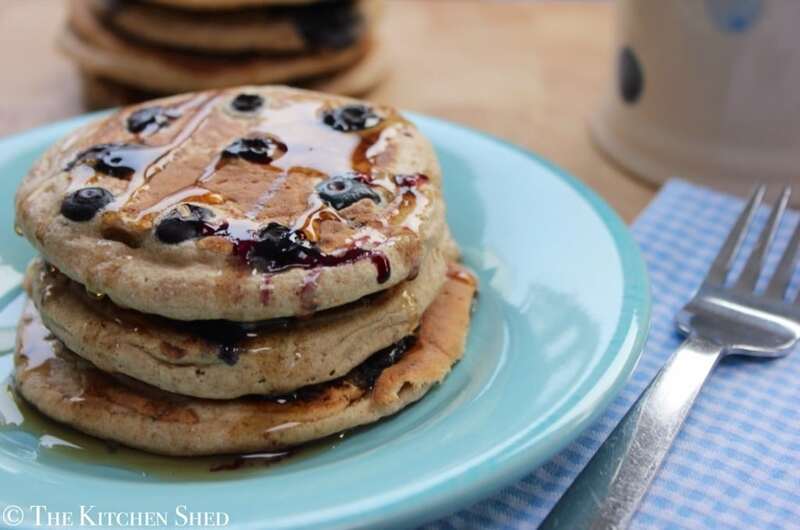 These pancakes are delicious and since the recent popularity of my Clean Eating American Pancakes, I wanted to post this healthy, fun alternative. My 5 year old is pancake crazy. He can eat twice as many as I can and still ask for more. 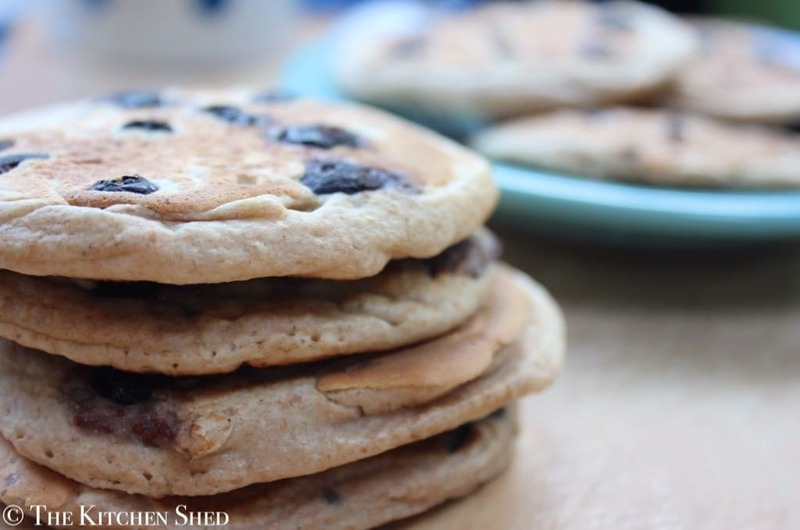 I love to be able to give my boys pancakes for breakfast every now and then, but I’m not a fan of cooking them first thing in the morning, so I had this great idea… I cook them the night before! Whilst the kiddos are in bed I whip up a batch and store them in the fridge ready to reheat in the morning. I pop mine in the toaster, but you could also reheat them under the grill. Genius! You can serve your Clean Eating Blueberry Pancakes with some extra blueberries and a side of natural yoghurt for the ultimate clean eating breakfast experience! Do you have any ‘make ahead’ Clean Eating breakfast recipes? Place the flour into a large bowl and make a well in the center. Crack the egg into the center of the well and whilst whisking, slowly pour in the milk until you have a nice thick batter. Heat up a non stick frying pan until it is hot. Once hot, turn the heat down to medium/low and pour 2-3 Tablespoons of mixture into the center. Take 1 heaped Tablespoon of bluberries and carfully dot them around the top of the pancake. Once the bluberries are on, take a peek underneath the pancake and if its nice and golden brown, flip it over and cook for a further 30 seconds or until done. I gently press the pancake down with a spatula to help it cook through. 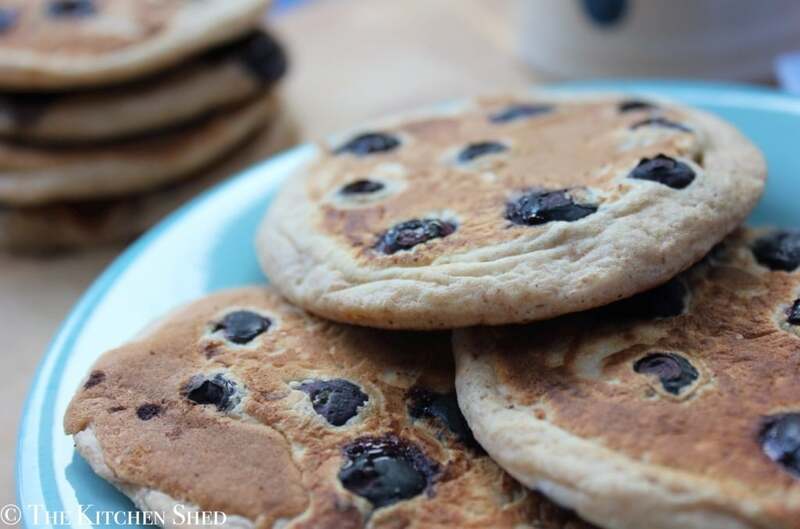 Because the blueberries create a little pocket of batter around them, I like to flip the pancake over again and cook for a few seconds longer, to ensure there is no raw batter inside the pancake. Serve with a drizzle of pure maple syrup and a side of natural yoghurt.